Protesters rallying against proposals for Leeds’ new £250 million trolleybus system made their presence felt outside Leeds Civic Hall. 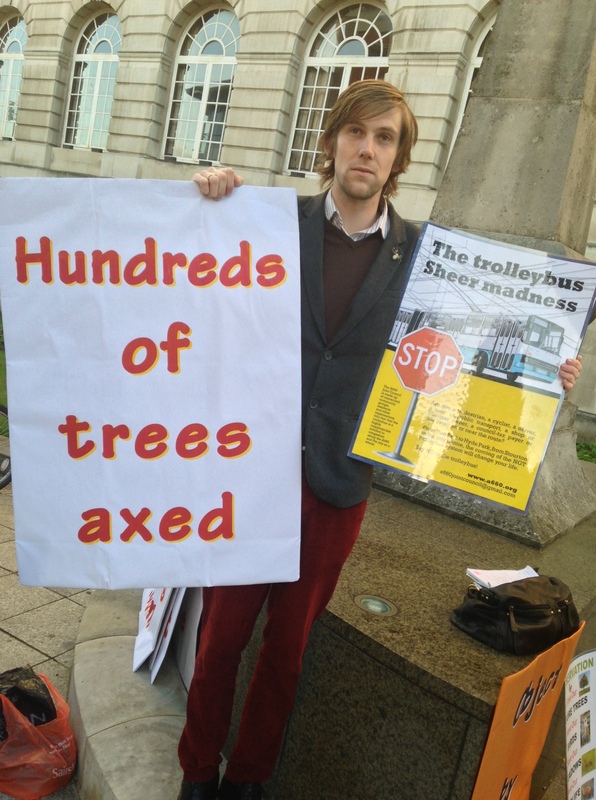 Around 30 protesters held placards and gave out leaflets ahead of a council meeting to discuss some of the planning issues facing the planned NGT (Next Generation Transport) trolleybus scheme. 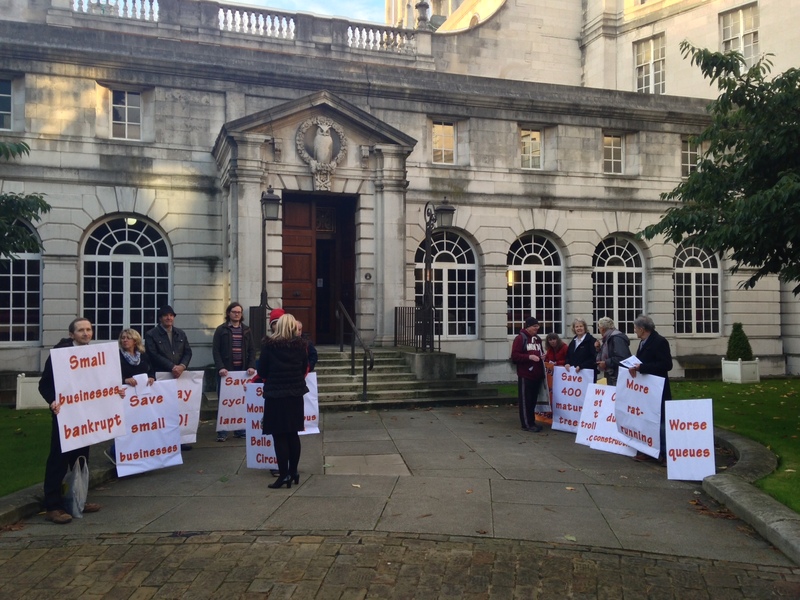 Although no decisions from the council were expected today, the meeting, due to last virtually all day, would look at some of the planning concerns raised by campaigners and councillors on the city’s main planning panel. As reported in the YEP yesterday, around 20 properties are set to be fully or partially flattened during the construction of the congestion-busting £250m New Generation Transport (NGT) system. “These plans are going to irrevocably change the landscape for a lot of people. Hyde Park Corner’s going to be badly affected. 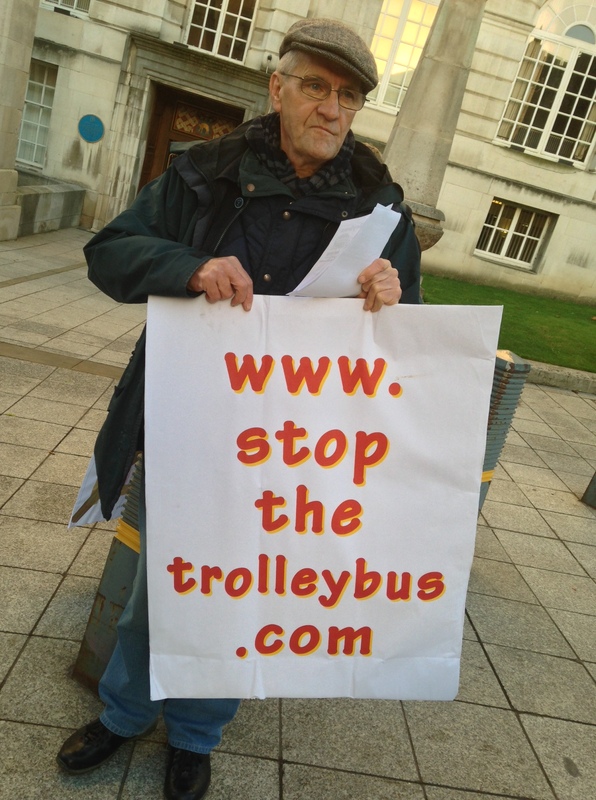 Protester George Geapin, from Temple Newsam, urged the council to reconsider the scheme. He said a whole fleet of battery-run buses could be bought for the price of the scheme. Campaigners also criticised the loss of trees and green space down the A660 and the impact on local businesses during construction. They claim the scheme could add to congestion on the A660. Leeds transport chiefs say the Leeds New Generation Transport plans will deliver a high-quality rapid transport system similar to those in Athens and Lyon, to transport people into Leeds city centre. The routes will run in new, segregated busways and bus-only lanes for as much as possible of the journey. They will have first preference at traffic lights and junctions to make the trip fast and comfortable. By speeding up journeys into and around Leeds, improving local connectivity and preventing the growth of congestion, it’s claimed NGT will provide a £160m per annum boost to the local economy and the creation of 4,000 permanent jobs. This entry was posted in News and tagged A660, Headingley, hyde park leeds, impact, Leeds Civic Hall, Leeds trolleybus, Monument Moor, protest. Bookmark the permalink. Trolley buses in principal are a good thing – especially if the electric can be produced from renewable energy – say windmills owned by the community through a community land trust. However the loss of green space & trees is bad. The millennium ecosystem assessment concluded that access to green space in urban areas was key to well being. Diesel buses are bad because of the hydro carbon & benzene pollution. As far as public spending – people think nothing of spending money on their home – yet our home planet Earth is in a shocking state – another conclusion of the millennium ecosystem assessment. If we’re going to spend money it needs to be on the planet – otherwise we’re dead. Leeds is in desperate need of an efficient public transport system, one that is dependable, quick and attractive enough to get people out of their cars. Whilst I sympathise with a minority group of protesters, we must prioritise our environment and the majority of citizens in the city. I just hope we don’t end up with a half baked system that neither serves the wider community or encourages a reduction in carbon emmissions. I would wish for a network of lanes dedicatwd solely for trolleybuses (sooner rather than later!). Trolleybuses were abandoned in the 1960s for many reasons which still aplly today. There are modern electric alternatives that do not suffer from the same drawbacks. Can you please inform us further? Trolleybuses were abandoned in 1960’s simply because diesel was cheap and trolleybus systems were very primitive. This is not the case now. Trolleybuses have no drawbacks, apart from visible catenary wires. A modern trolleybus can change lanes, disconnect from the catenary and go for a few kilometers on batteries or ultracapacitors or continuously with an on-board generator. They have continuous high and smooth torque. A trolleybus can stop at a steep uphill bus stop, fully loaded and start again with no problems. The vibration and noise on the vehicle is minimal compared to a diesel vehicle, which also helps longer vehicle lifespan . A modern catenary contact system can handle higher speeds and junctions automatically. You can have a powerful and very sophisticated air conditioning system on the trolleybus.